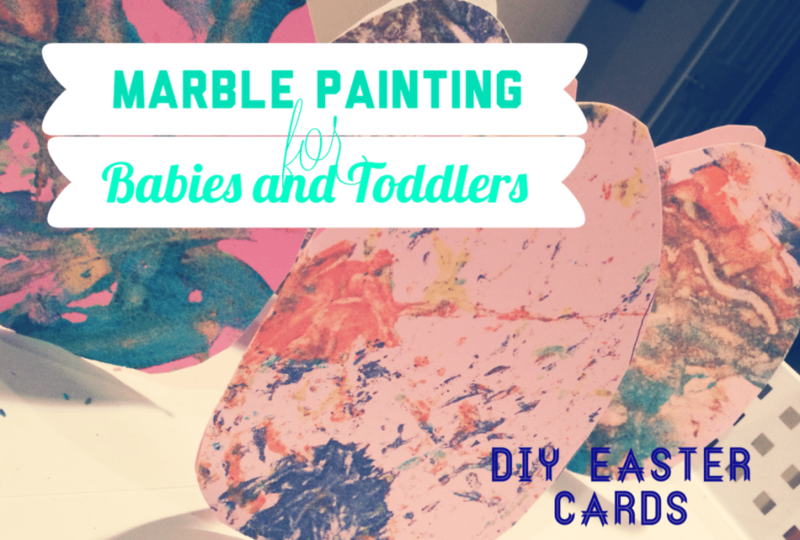 Marble painting is a wonderful method of crafting for toddlers and young children but traditionally is not the safest activity for babies because of the choking hazard. However, the technique is one that babies love so we adapted it for A (9 months) and used larger plastic balls (used in a ball pit) and big bouncy balls that rolled very well. Not only did she enjoy the painting but she also loved just playing with the messy balls! In another attempt to make this project baby-friendly we used our homemade flour paint. Ava can really only do any craft that is ‘edible’ as she still really likes to explore everything by putting it in her mouth. There are some other homemade paints for babies, but we really liked the flour paint for this project as it was nice and thick and didn’t just run all over the paper. We also decided to take our project a step further and make some homemade gifts for family members with our finished product by turning them into Easter cards! Grandparents love getting cards in the mail that the kids have made for them which makes for a fun, and inexpensive, gift! We had such a beautiful day today so decided to take our messy crafting outdoors (which is always a plus for me as it makes cleanup much easier and I don’t have to worry about paint all over the house). I laid down one of our vinyl tablecloths to make for even easier cleanup, a tarp would work just as well if you want to contain some of the mess or give a clean area for the kids to sit on. We also used two plastic bins but cardboard boxes would work just as well. Next, you want to tape your paper down inside your bin or box, put a few dollops of the paint on the paper, and add the marbles to the bin! These are the balls we used for A so that she wouldn’t choke on any marbles in the process. 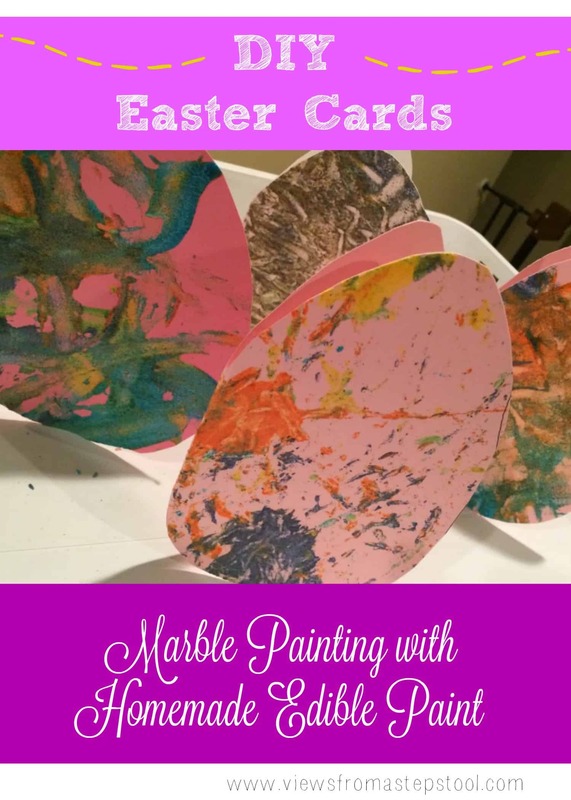 Your child can shake the box around and let the marbles do the painting! A couldn’t really shake the box so she just played with the balls in the bin and painted by throwing, dropping and rolling them around. M eventually took to a paintbrush so that he could mix some colors together. I love how he always likes to put his creative spin on every project I put together for him. They never quite turn out the way I envision them, but I love that they are a product of his creativity. Naturally, A tasted the paint and wasn’t a fan, but this is why I love using the homemade, edible paint! I can just let her explore without having to worry. But you can definitely do this product with tempera paint for older children to make it an easier, and quicker, project. Once they were done with their paintings we left them outside to dry completely. We then folded the paper in half and cut them into an egg shape for our cards! They are going to be great to send out for Easter. I’m so pleased with how they turned out! For more crafting activities for kids check out my Toddler Crafts board on Pinterest.